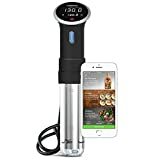 There were a few different sous vide cookers on sale for Prime Day earlier this week, but the most popular one among our readers was the Anova Culinary 800 Watt Sous Vide Precision Cooker with Bluetooth. The pricier model with Wi-Fi was also on sale, but our readers apparently recognized that spending the extra cash isn’t really worth it since there’s not really any reason to control the cooker when you’re not in Bluetooth range anyway. Whatever the case, the 800 watt model outsold every other sous vide we covered for Prime Day, and we have some good news and some bad news if you missed it. The good news is it’s still on sale at a deep $60 discount. The bad news is the price isn’t quite as low as it was for Prime Day. It’s only $10 higher though, so you’re still getting a killer deal if you missed out on the Prime Day price. And trust us, this cooker is worth its weight in gold if you want the most delicious food you’ve ever eaten — remember, sous vide cooking locks in all that flavor since it has no way to escape!